The youngest learners at Kids R’ Our Future are well on their way to a lifetime of learning with our Infant-Toddler Program. 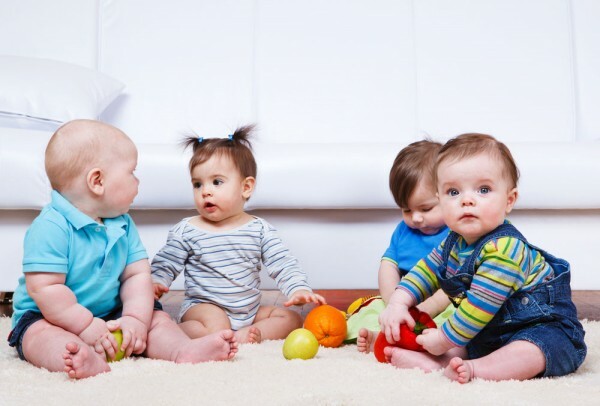 Infants, as young as six weeks old, are immersed with stimulating, hands-on play. Kids R’ Our Future is a place for love, growth, and discovery. Each activity is designed to assist your child in achieving developmental milestones, while having fun at the same time. Kids R’ Our Future knows the importance of nurturing when it comes to babies. Providing plenty of hugs, love, and personal attention is something we include throughout our Infant-Toddler Program. Your baby will enjoy singing, giggling, reading, cuddling and of course Tummy Time in our safe, secure state-of-the-art facility. Learning centers, with educational and developmentally appropriate toys designed for learning, create a bright and exciting environment for your child. Expanding the imagination and strengthening the muscles has never been more fun! Weekly lesson plans provide activities designed to develop skills necessary to accomplish developmental milestones. Our extensive Infant-Toddler Sign Language Program, which is known to eliminate frustration for children who have yet to form their verbal vocabulary, introduces age appropriate language skills for non-verbal communication. Kids R’ Our Future is one of the most loved daycare and child care providers in chandler. • Daily reports and weekly lesson plans to keep you informed of your child’s development.